Police and Prisoner Guards' Wives Association head supports policemen who refuse to work without proper safety precautions. 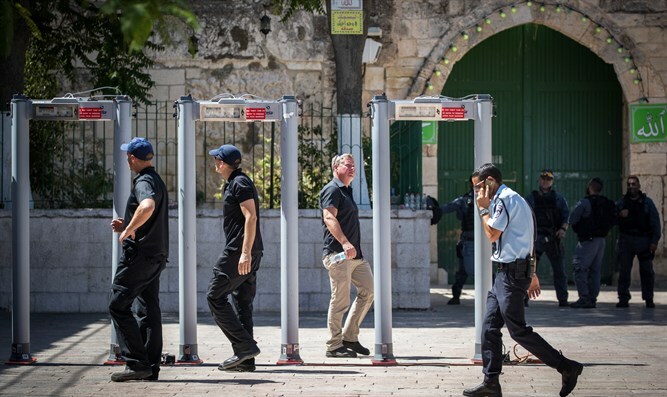 Policemen stationed on the Temple Mount showed concern over the Security Cabinet's decision to remove the magnetometers previously placed on the Temple Mount and wondered if they were "sitting ducks in the firing range," they said. Arutz Sheva spoke with Avigail Sharara, who heads the "Police and Prisoner Guards' Wives Association." According to Sharara, both policemen and their families are worried about the consequences of the Cabinet's decision. "It's unthinkable that the Cabinet should endanger the security of policemen and visitors to the Temple Mount," Sharara said. "These policemen are doing holy work, protecting Israel's citizens. Their security is important." Though Sharara isn't sure what percentage of police officers oppose the decision, she "believe[s] the numbers are high. Maybe not everyone says it openly, but the policemen's families are hurt, maybe even more than the policemen themselves." "What mother wants to send her son, and what wife wants to send her husband, to a place with insufficient security, where a horrific attack may occur at any second?" she asked. "The Temple Mount is an unusual situation. It's a place where policemen are murdered in cold blood. We need to give these policemen maximum protection, and not make their lives a free-for-all." Regarding the policemen's wives protest, Sharara said, "In the meantime, we hope the Israeli government and the Security Cabinet will make decisions protecting policemen." She hopes the proposed alternative security measures will be able to properly replace the metal detectors and protect both visitors and the Temple Mount's policemen.